40%, and so, unless we can reduce this range, the size of the body can only be obtained to an order of magnitude. Comparison of Fr (0) with the flux density Fe of the infrared radiation emitted by the asteroid by virtue of its temperature has provided estimates of p, as have studies of the polarisation of the reflected solar radiation. The details will not concern us. Indirect techniques have provided nearly all the size data in Figure 3.5. The data have not been extended to sizes much below 10 km radius because at smaller sizes there must be a significant proportion of undiscovered asteroids, the proportion increasing with decreasing size. Even with this cut-off, the general increase in the number of bodies with diminishing size is clear. The general shape of the curve is consistent with an initial population modified by mutual fragmentation as a result of collisions. You have seen that it is thought that during the formation of the Solar System, there were several embryos between Mars and Jupiter, plus a host of smaller bodies, and that further growth was halted by the formation of Jupiter, whose gravitational influence 'stirred up' the asteroid orbits. This increased collision speeds to the point where net growth was replaced by net fragmentation. Note that this is net fragmentation -some reassembly of fragments is to be expected to create rubble piles. And so it continues today. Even though the number of asteroids increases as size decreases (Figure 3.5), it does not follow that the host of tiny asteroids doubtless awaiting discovery will add significantly to the mass of those already discovered. Explain why this is so. The term 'radius' in Figure 3.5 has to be interpreted with care. The self-gravitational forces inside an asteroid result in an increase of pressure with depth. If the pressure exceeds the strength of the solid materials in the interior, then the materials yield, and a roughly spherical body results, flattened by rotation at high rotation rates. The internal pressures decrease as the size of the body decreases, and there comes a point where the materials do not yield, and so the body need not be even approximately spherical. For an asteroid made of silicates and iron, the critical radius is about 300 km. Therefore, below this size 'radius' means an average distance from the surface to the centre of the asteroid - the body is not necessarily anywhere near spherical. □ Are any asteroids certain to be (very nearly) spherical? From Table 1.3 you can see that only Ceres is significantly larger than the critical radius. Therefore, we can be confident of a near spherical shape, and this is found to be so. Note that if a body is significantly non-spherical we use the word 'across' rather than 'radius'. In some cases two or three dimensions represent the body fairly well. Earth-based radar. The image of Toutatis in Figure 3.6(d) was obtained in December 1992 when it passed the Earth at a range of only 4 x 106 km. Eros, another NEA, was orbited by NEAR in 2001, which made a landing on 12 February 2001. Figure 3.6(e) is an image of Eros from NEAR when it was in orbit. If, as is thought, the Martian satellites Phobos and Deimos are captured asteroids then these also belong to the list of those imaged. Figure 3.6(f) is a Viking Orbiter image of Phobos; Deimos is broadly similar. Many asteroids have had their shapes determined indirectly. All asteroids rotate, almost all with periods in the range 4-16 hours, and as they rotate, the observed flux densities Fe and Fr (0) vary with time. There are two possible contributory factors: surface features, and changes in the projected area resulting from non-spherical form. From the variations in Fe and Fr (0) these two factors can be separated. The outcome, as expected, is that large departures from spherical form are common among asteroids. When repeated imaging of an asteroid is possible, the rotation period can be obtained directly. For example, the HST has discovered a dark patch on Ceres, and repeated observations have yielded a rotation period of 9.1 hours. The rotational data also show a broad range of axial inclinations. These, and the range of rotational periods, are consistent with models in which small bodies frequently collide. Irregular shapes are expected from collisional fragmentation, though in some cases a small asteroid might retain the irregular form it acquired at its origin. 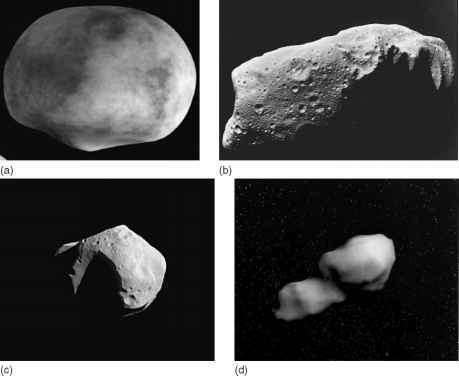 The heavily cratered surfaces of asteroids (Figure 3.6) also bear witness to collisions, in this case with smaller bodies. Irregular forms can also arise from the subsequent sublimation of volatile components. Conversely, small bodies can become more spherical through erosion by dust impact. Surfaces exposed to repeated impacts are expected to acquire thin layers of dust, and observations of light reflected and IR radiation emitted indicate that a thin dust cover is indeed a common feature. A few asteroids have had their masses measured with useful precision. Close approaches of small asteroids to Ceres, Pallas, and Vesta have yielded mean densities of 2100 kgm-3, 2710kgm-3, and 3440kgm-3 respectively. The orbit of Ida's tiny satellite Dactyl indicates a density for Ida of (2600 ± 500)kgm-3. The NEAR mission to Eros in 2001 obtained (2500 ± 800)kgm-3. Itokawa, another NEA, has been orbited by the Japanese spacecraft Hayabusa since September 2005, and has obtained a density of about 2500kgm-3. All of these densities are consistent with high proportions of rocky materials and, except for Vesta, low proportions of the much denser metallic iron. By contrast, the effect of Mathilde on the path of NEAR corresponds to a density of only (1300±200)kgm-3. 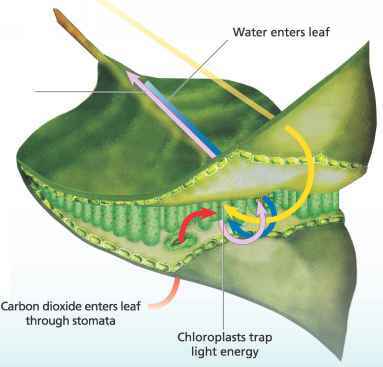 Such a low density could be due to hydrated substances in abundance, but analysis of the light reflected from the surface indicates otherwise. Therefore, the low density might indicate high porosity, such as could arise from disruption and (partial) reassembly as a rubble pile. High porosity helps to explain how Mathilde could have survived the large impacts that produced its heavily cratered surface - porosity cushions impacts, thus preventing disruption. A low density has also been obtained for Sylvia, which has two small satellites. The value is about 1200kgm-3 which might mean that Sylvia is also a collision-created rubble pile, its satellites being fragments from the collision. Many tens of asteroids are known to have satellites, and therefore each of these asteroids could have its density determined. Rocky materials thus seem to dominate the few NEAs and asteroids in the asteroid belt that have had their densities measured with useful precision. From such a small sample we certainly cannot infer that all the asteroids are mainly rocky, not even the NEAs and the asteroid belt members, far less so the Trojans and Centaurs. Indeed, surface compositions vary hugely, and these lead to inferences about the interiors, as you will see in the next section. (a) Why have gravitational forces failed to make the bodies in Figure 3.6 more spherical? (b) If a small asteroid were spherical, what would this tell us about its possible histories? The surface composition of an asteroid can be inferred from a combination of various types of data. These include ratios of the reflectance in different wavelength bands, derived from flux density measurements. If the bands are very narrow, numerous, and contiguous the measurement is called spectrometry, otherwise the measurement is called photometry. Further data include the geometrical albedo, and the polarisation induced in reflected solar radiation. 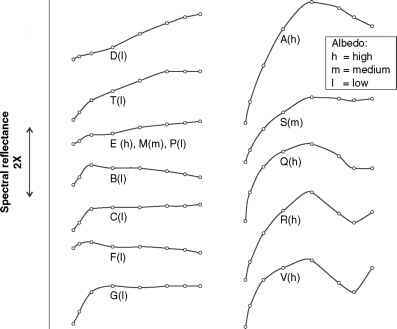 Figure 3.7 Reflectance spectra and geometrical albedos of the 14 Tholen asteroid classes. Note that the reflectances show spectral shape on a logarithmic scale, not absolute values, and that the spectra are offset vertically by arbitrary amounts.